Urban development nationwide has swallowed more than 23 million acres of agricultural land in the last quarter century. As a fourth-generation Arizona farmer, Matthew Moore is not the first to face the reality that one day soon, his family’s property will be completely engulfed by urban development. In order to save his family’s farming legacy, if not the farm itself, Moore set about documenting everything his farm produces. He set up solar-powered time-lapse cameras paired with weather-tracking systems, covering the entire growing period of his crops. He collected his compendium of short films into a project called Lifecycles. 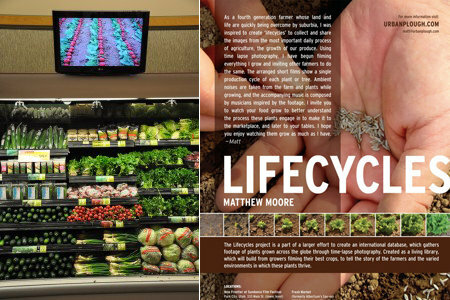 Fittingly, Lifecycles had its feature debut in a supermarket. With support from the Sundance Institute’s New Frontier Program, Moore set up monitors above the produce section of a Fresh Market grocery store in Park City, Utah. He let the footage run on a loop for 10 days during the 2010 Sundance Film Festival. While delicate growing patterns of squash, radishes, and broccoli unfolded on-screen, customers were invited to take a moment to reflect on the effort it takes to produce the surfeit of food to which Americans are accustomed. Moore says he packs around 110,000 pounds of carrots a day, yet he’s never seen his produce in his area’s supermarkets. “It’s much like the art market,” he said. “I don’t know the buyers and the brokers don’t tell me.” His organic CSA is small but growing and he says his customers seem to take comfort in the personal connection. “The food tastes better because they know me,” he says. He’s looking for start-up capital through the online crowd-sourcing site United States Artists, and he’s recruited a pair of farmers in California and Kentucky into his first class of contributors for this summer. Moore hopes to have recording equipment in the hands of six more farmers—including at least two in Arizona—by the end of 2011, as the next stage of his project’s world-wide expansion.